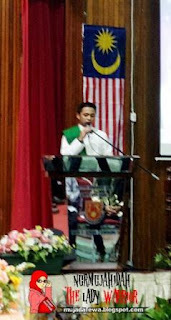 honestly speaking,, i have never watched program imam muda,, i have just known about IM ASYRAF when people were talking about him coming here,, to this ipg,, banners with his picture lama amat hung here and there,, lama dah,, and i was like,, who is this in the picture??? la,, he is the winner for the FIRST SEASON OF IMAM MUDA PROGRAMME,, mmm,, handsome,, hahaha,, then i told mz,, min,, malas la rasa nak pergi,, bang!!!! kena marah,, ok,,, repenting now,, hehe.. mz dah bagi warning awal2,, muja, he is married,, what??? so what?? wekkkk kat ko la mz!! jarang-jarang this hall of us boleh nampak penuh macam ni,, and this is all because of him,, his words,, and his speech,, tq for meeting us IM ASYRAF,, we really appreciate it..
once 'falling in love' with somebody tu,, confirm la habis benda we check it out about him right,, aku pun godek-godek google,, then,, check it out what i have found out..